The city is the spatial manifestation of the relationship between people and power and results as the stratification of consecutive political visions. Democracy has nowadays lost its connection with the urban daily life and it is mostly sustained without people’s involvement; consequently, public space is perceived as the manifestation of decision-makers and people find it hard to claim their right to it. The recent riots in Greece show how citizenship is now expressed through frustration and friction, as a reaction to top-down decisions, without being constructive. 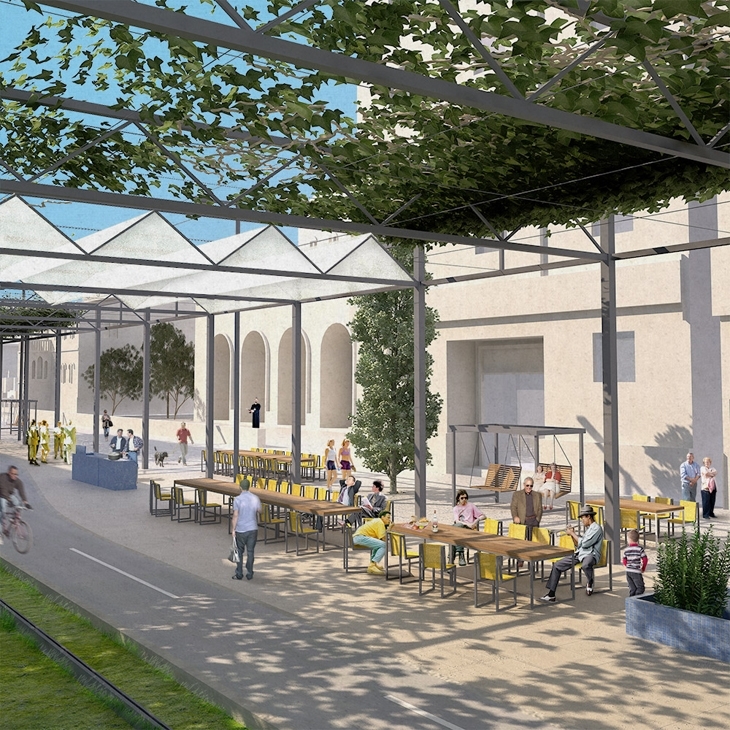 Historically public space was more important than private space; in the Agora, Stoa was the place for discussion and exchange, surrounded by daily activities that constituted the core of the society. 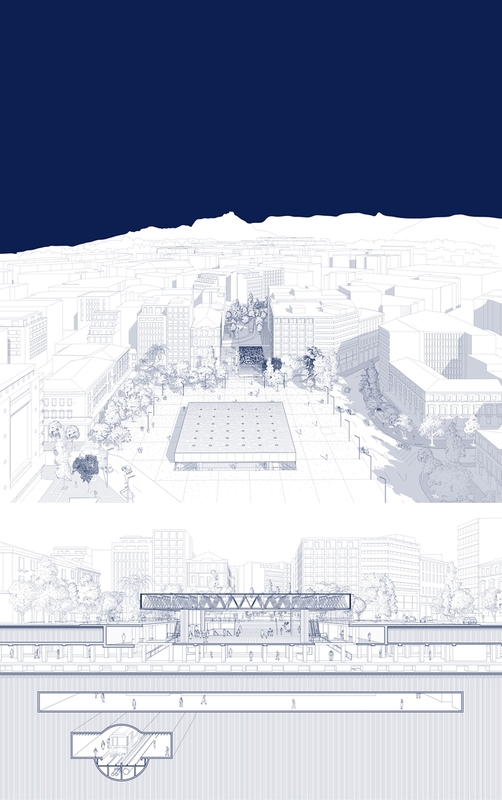 The direct democracy of ancient Greece could be the reference for a contemporary urban model which includes members of all age and social groups, in which stoa as its spatial consequence inspires a new approach to public space. Big urban gestures express a top-down set of mind and tend to neglect the existing layering of the urban realm. The latter resembles a palimpsest that includes successive materializations of the social economical and political conditions that prevailed from ancient Greece to the modern era. However the current economic and social situation asks for flexible and cost-effective solutions that rely on people’s contribution. The crisis should be dealt with as an opportunity to introduce an additive approach that would lead to a greater benefit out of the minimum intervention. 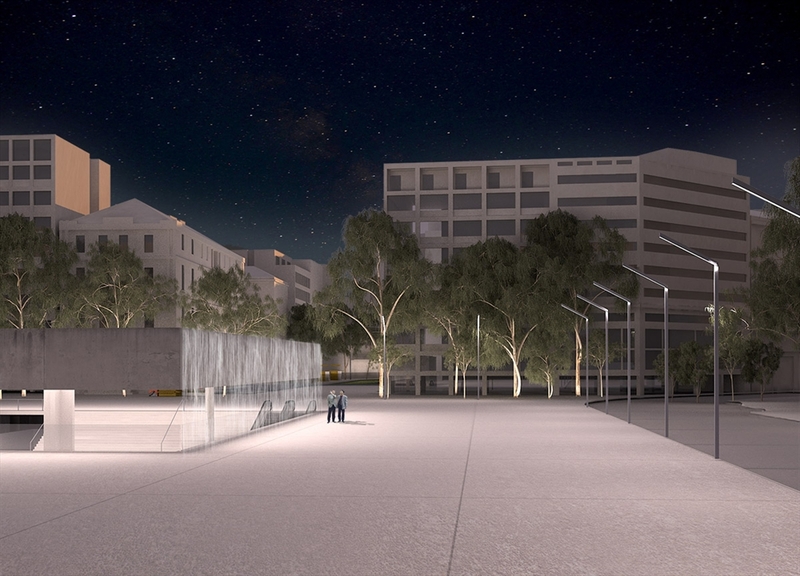 The proposal provides an intense linear space that will awaken hibernating potential for activities to shape the surrounding territory that will be unburdened of the existing restrictions to constitute a field enriched with traces of the city’s memories. Technology carries along great potential for re-establishing the bond of citizens with the city; by grafting the infrastructure, which is an effective, costly and permanent intervention, the city will be provided with a framework for spontaneous appropriation. 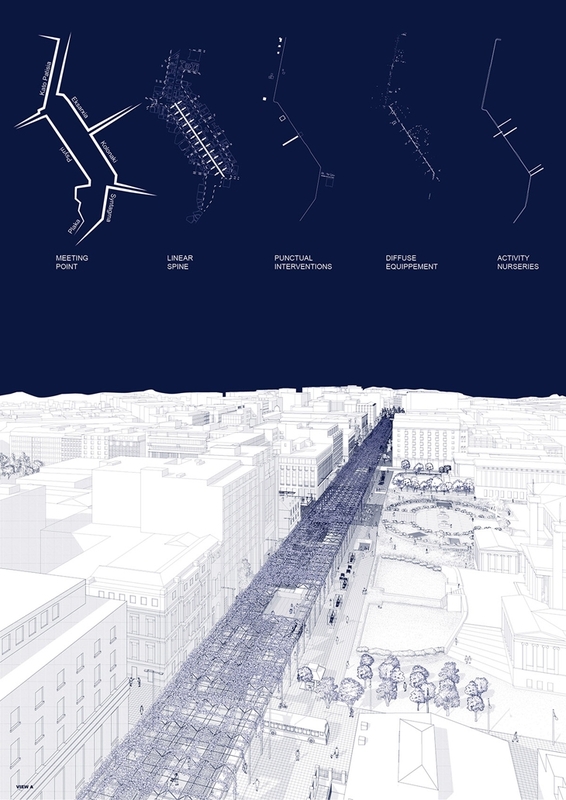 Along with the tramline an infrastructural spine is created for small-scale elements to be plugged-in and serve people’s contemporary daily needs as expressed and modified in terms of locality and weather conditions. The mild Mediterranean climate expressed in a virtual nine-month summer instilled an innate gregariousness thereby affecting the character of their activities and the way they are spatially manifested. Kitchens, tables, lounge chairs, workstations, bathrooms, ponds, projectors, power sockets and Wi-Fi, water fountains, herb gardens, bike repairing stations, gyms create a habitable environment. 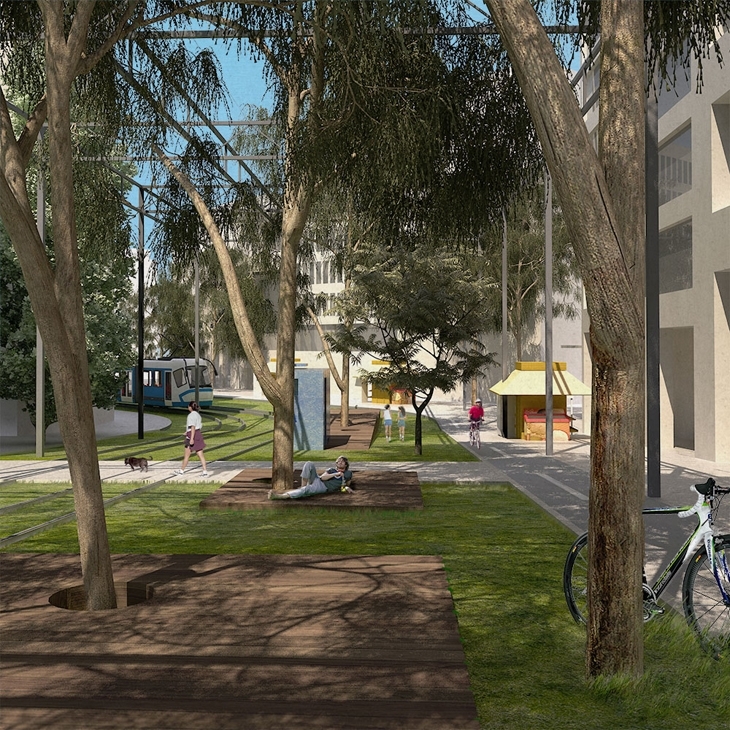 A phased construction approach allows the proposal’s basic tenets to adapt to any concurrent social, economic and political changes without interrupting the fluidity of experiencing the urban reality. The expected appropriation will trigger people’s creativity, stimulate small-scale productions and revive arts and crafts for an alternative lifestyle. 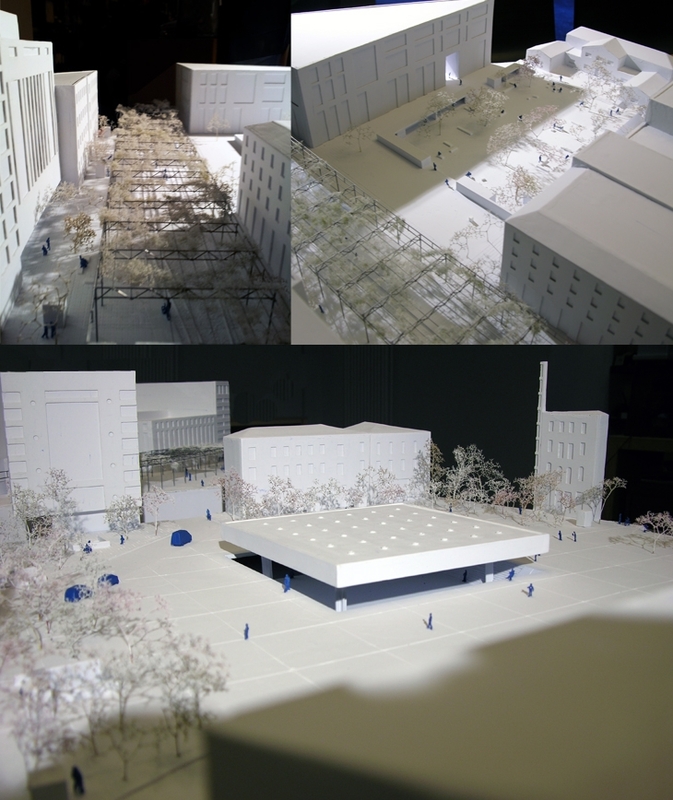 It will create the premises for a new practice of democracy, one interwoven with everyday life. 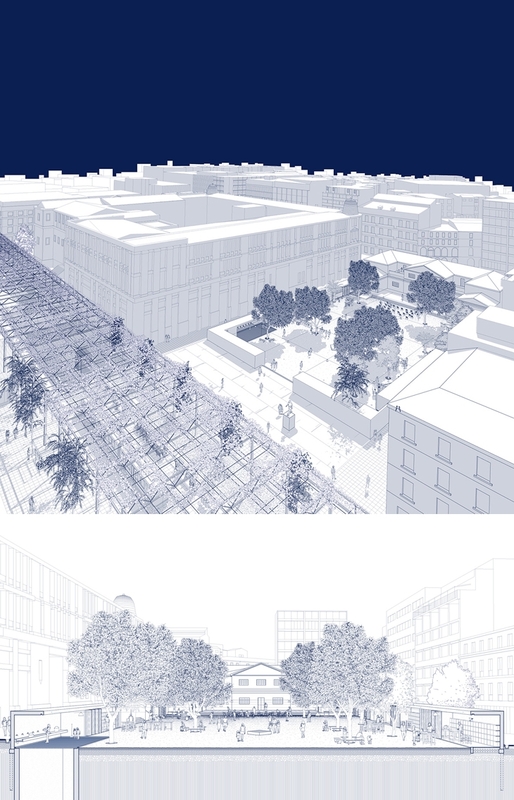 MODELS: PANEPISTIMIOU STREET, DIKAIOSYNIS AND OMONOIA SQUARE. 2 PANEPISTIMIOU STREET- CHANGING THE ROAD INTO A PEDESTRIAN AREA DOES NOT NECESSARILY CREATE A LOCUS. TAKING ADVANTAGE OF THE PLANNED TRAM LINE WE CONCENTRATE THE EFFORT ALONG THE INFRASTRUCTURE IN ORDER TO CREATE THE CRITICAL MASS FOR A LOCUS TO BE FORMED. THE POTENTIAL THAT EXTENSIVE INFRASTRUCTURE CARRIES ALONG CAN BE USED TO STIMULATE IMPROMPTU INITIATIVES. THE PERCEIVED FORM OF THE CITY IS SHAPED BY THE DAILY, INDIVIDUAL ACTIONS OF ITS INHABITANTS. TO PROVIDE A SPATIAL FRAMEWORK WHICH ENCOURAGES AND TRIGGERS CREATIVE INITIATIVES IS AN INVESTMENT TO THE INHABITANTS EXPECTED APPROPRIATION OF THEIR URBAN ENVIRONMENT. 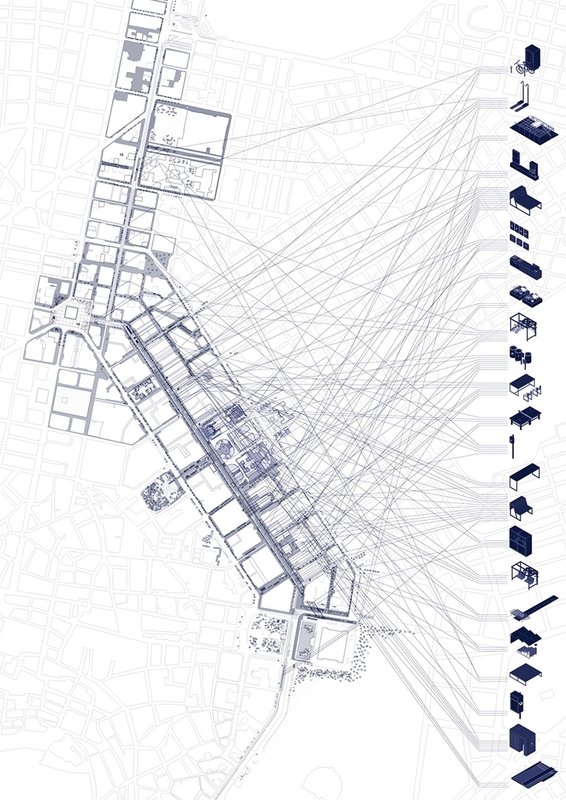 THE PROPOSED INFRASTRUCTURE ALONG WITH A VARIETY OF EVERYDAY APPLICATION MODULES SERVES AS A MATRIX TO FOSTER SPONTANEOUS EVENTS IN THE SURROUNDING CITY FIELD. 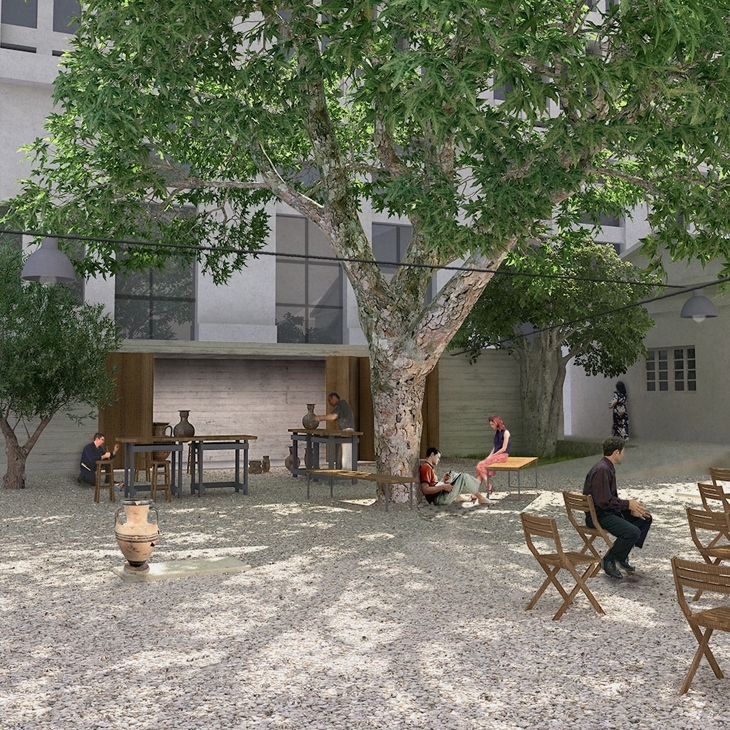 THROUGH SMALL SCALE FACILITIES PEOPLE REGAIN THEIR RIGHT TO RETHINK ATHENS. KORAI AND PANEPISTIMIOU STREET- KORAI, DUE TO ITS POSITION AMONG TWO MAJOR CITY NODES (TRILOGY COMPLEX AND KLAFTHMONOS SQR. ), IS BOUND TO PLAY A PIVOTAL ROLE. 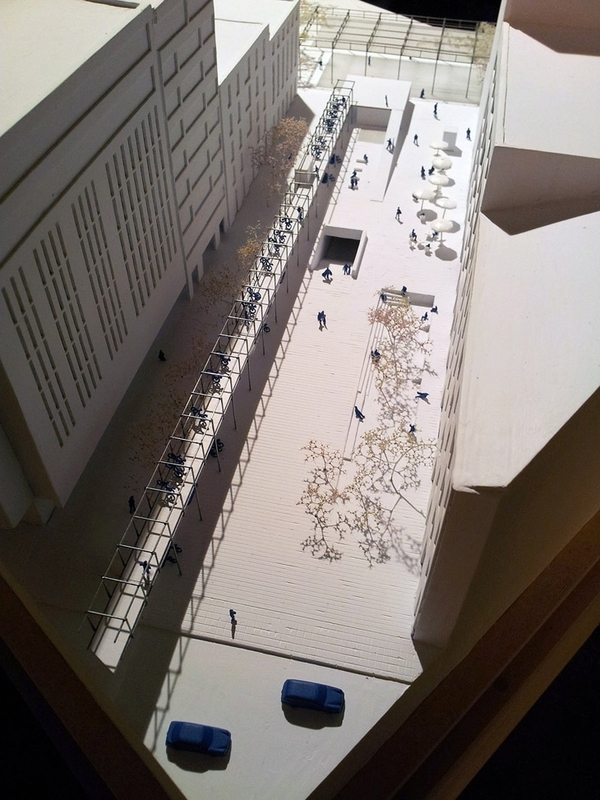 BY INTRODUCING A LINKING ELEMENT IN THE FORM OF A LIGHT METAL PASSAGEWAY HOUSING A BIKE PARKING, KORAI EMERGES AS A PIECE OF CONNECTIVE TISSUE BETWEEN TWO MAIN URBAN ORGANS ENABLING THEM TO ACT IN UNISON. 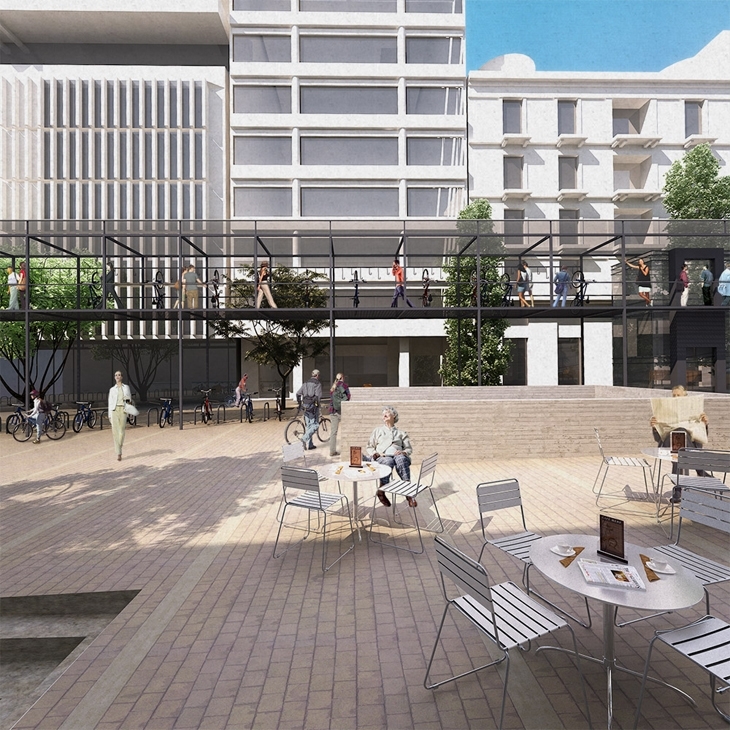 THE INCREASING USE OF THE BICYCLE AS A TRANSPORTATION MEANS REINFORCES THE HUB LIKE CHARACTER OF THIS WALKWAY. DIKAIOSYNIS SQUARE- A SPACE FORMERLY PERCEIVED AS BLAND AND DISPERSED WHERE NOBODY WOULD ENTER IS BEING WALLED TO TRIGGER PEOPLE?S CURIOSITY. ONCE INSIDE, THE WALL CONTAINS FACILITIES FOR SMALL ART AND CRAFT WORKSHOPS THAT PROVIDE AN OUTLET FOR CREATIVE VENTURES. A NEW KIND OF ACTIVE APPROPRIATION OF URBAN SPACE IS THUS ENABLED, WITH A MULTITUDE OF CRAFTSMANSHIP ITEMS CREATED, REINSERTING THE SMALL SCALE MANUFACTURE IN THE INHABITANTS? EXPERIENCE. 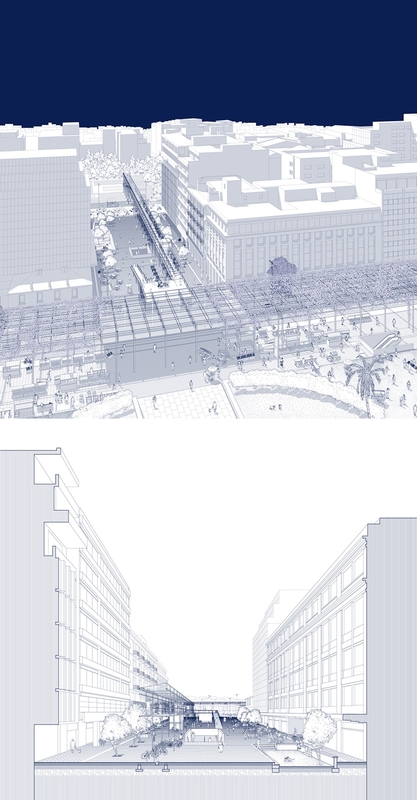 OMONOIA SQUARE- THE FLUX OF PEOPLE, ON THE SQUARE?S GROUND LEVEL WAS UNTIL NOW LIMITED TO THE PERIMETER, WHEREAS THE REAL HUSTLE AND BUSTLE WAS TAKING PLACE IN THE UNDERGROUND CENTER OF THE STATION. 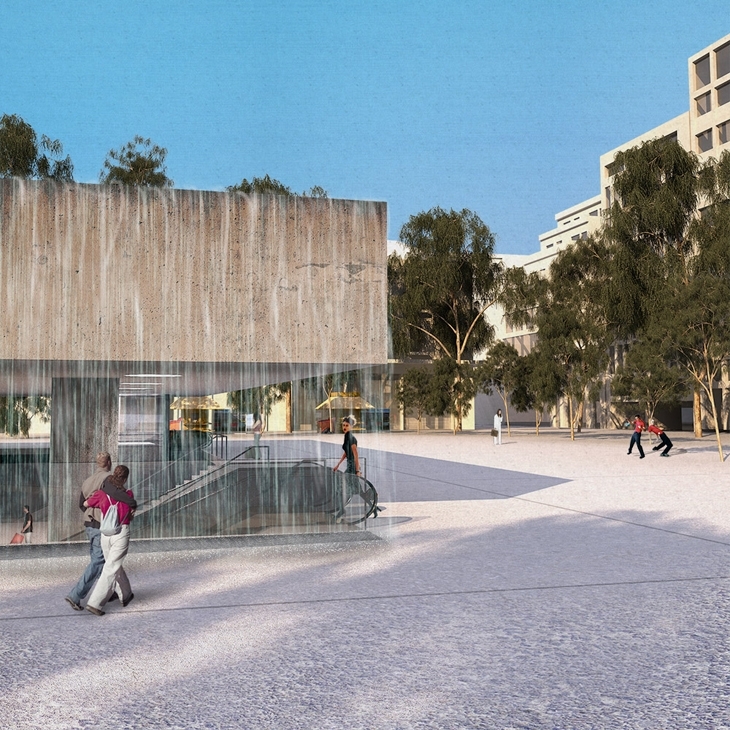 TO BRING THIS ACTIVITY TO LIGHT, A CRATER IS FORMED BY LIFTING THE SQUARE ROOF- LID OFF THE GROUND, THUS IMBUING OMONOIA SQUARE WITH A LONG LOST CENTRIPETAL DYNAMIC.